The importance of safe material handling equipment operation such as forklifts cannot be underestimated. As a complement to training and active ongoing supervision, one way to promote safe operation is through heightened awareness and skill that comes from participating in operator competitions. Such competitions are most popular for forklifts. While forklift competitions are held under various names, such as forklift rodeo, forklift championship, and forklift competition, the purpose is the same – to promote skills excellence and safe operator practices. Such competitions may be held by a particular company at a specific location for its employees, or competitions can be open events that solicit participants from a variety of companies. The B.C. Forklift Championship, for example, until it was recently discontinued, involved a two-step process. The first step required competitors to complete a written test involving 20 multiple choice questions. The second part required participants to maneuver a demanding course designed to showcase the skill and safe operation practices of equipment operators. Washington State Forklift Rodeo, sponsored by the Washington Governor's Industrial Safety and Health Advisory Board, the group reports that the event continues to grow at both regional events, as well as at the Finals, which are held in conjunction with the annual Governor'sIndustrial Safety and Health Conference. The goals of the Forklift Rodeo Committee are to showcase the safe operating skills and talent of the best operators in the state, as well as to provide education about forklift safety to all operators as well as the general public. Columbia Forklift Challenge, sponsored by the Oregon Governor's Occupational Safety & Health Conference (GOSH), the next event, entitled the Columbia Forklift Challenge, take place on March 8, 2017. Prizes to winning individuals and teams range from $200 to $500. Stapler Cup, is an international event sponsored by Linde, taking place in Germany. You can watch a short video of the 2016 Staplercup at this link. At the national level, individual countries such as Austria hold national championships. The Austrian event took place in June 2016, involving 150 operators from all around the country, with the support of 500 spectators. The top three competitors qualified for the International Staplercup in Germany, to compete against the best operators from 20 countries. RTITB and SUMOglove Lift Truck Operator of the Year Competition (U.K.) The event was established in 2008 with the sole purpose of identifying the best in counterbalance forklift operator skill and safety. The event continues to grow in popularity. Raising awareness of safe practices in lift truck operation is a serious business that needs to be reinforced on a regular basis and not just at annual events. This is why documented training, effective supervision of forklift operators, frequent discussions at team meetings, and raising overall awareness is so critical to workplace safety. 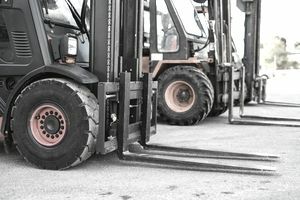 Forklift competitions can provide an engaging complement to other components of your safety program.